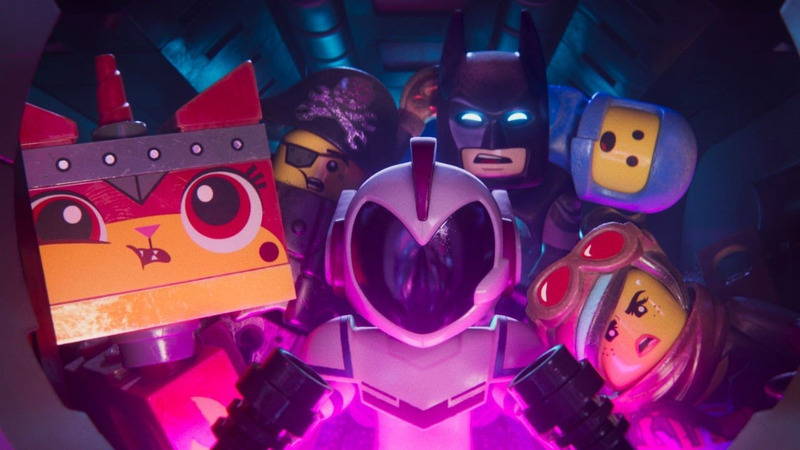 Much better than its lukewarm commercial reception lets on, The LEGO Movie 2 may not surpass its progenitor, but it's probably the worthiest sequel it was ever going to get. 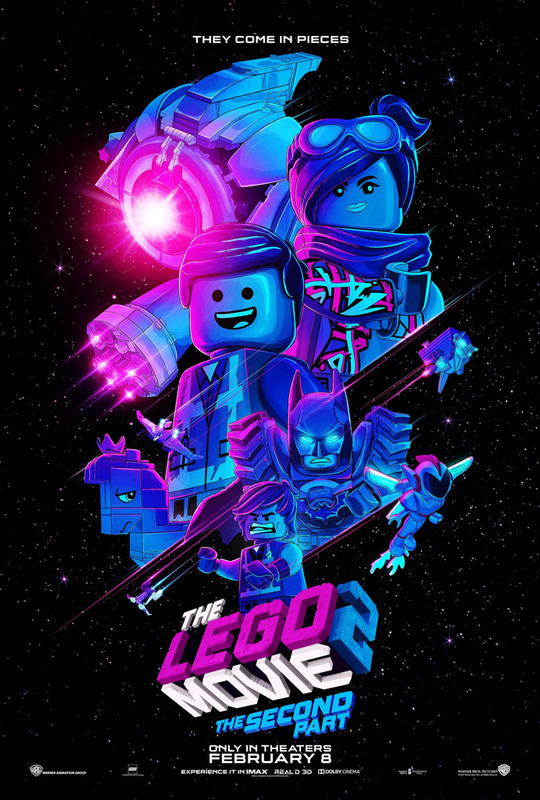 In the grand theoretical sense, and this has been borne out by experience, no sequel to Phil Lord & Chris Miller's The LEGO Movie was ever going to be as good as it was, because whether they came back to write it (this time they did) or whether they directed it (this time they didn't), or whatever, there was never going to be a second time that you whispered to yourself in disbelief, "My God, this is actually working." If it works now, the shock of the new has faded a little, or a lot; and if it doesn't work, as The LEGO Batman Movie did not for every one of its last twenty cross-promotional minutes, and as The LEGO Ninjago Movie did not whenever it emphasized that its protagonist's name was properly pronounced "Luh-loyd," in other words in every fifth line of dialogue—and as, in fact, sometimes The LEGO Movie 2: The Second Part itself does not—then that's just all there is to it, giving you ample opportunity to really think about how it's not working, even while you're in the middle of watching it. Each of them make you appreciate anew just how astonishing The LEGO Movie's success was, or at least how it achieved that success. That's especially true now, with its first direct sequel, which largely repeats the first film's story, while getting one of the biggest things The LEGO Movie got right pretty darn wrong. This would be an unnecessarily abstract way of saying that the reveal at the end of The LEGO Movie casts its shadow long and deep over everything that ever happens in The Second Part, so that any time it lets up at all, you're asking questions the movie simply has no way of answering. The first film's narrative, you recall, turned out all along to be the reflection of the tantrum play of a child, Finn (Jadon Sands), denied access to his dad's collectibles. If young Finn's psychological fragments were, in retrospect, implausibly pop culturally savvy, you either didn't notice this or weren't supposed to, since his story's utterly basic themes combined with an extrinsic, semi-sophisticated mockery of those themes was the biggest part of the fun; more importantly, Finn's story granted The LEGO Movie a unitary perspective that tended to reconcile its disparate parts, and this perspective is only upended in the emotional climax of the finale, when it becomes what it was supposed to be all along, a story being told by father and son together. It's incredibly sweet; I won't deny it's cryworthy. The Second Part can't replicate that kind of surprise, of course, and to some extent even depends on you knowing about the existence of its outer reality going in. But even that's not the problem; the problem is that The Second Part has no idea who's telling its story, and I sure can't figure it out, since from scene to scene or even line to line it seems to shift completely without any sense of underlying logic. The best I can come up with is that the LEGO Movies' characters never actually existed in Finn's imagination, but rather in some strange collective consciousness, wherein tropes are hashed out and familial demons are exorcised, which admittedly would explain some of the inconsistencies throughout the four-film franchise, though The Second Part comes so close to going the full Toy Story that it almost breaks its fictional and metafictional universes alike. But, and this is important, you only think about this when it's not working. (Or maybe you actually don't think about it at all, and I shouldn't ascribe thoughts and feelings to a strawman reader who shares my apparent interest in interrogating the metaphysics of cartoons.) Anyway, most of the time, it is working, not usually but sometimes right up to the level of its predecessor, and if anything I want to go easier on the movie than I probably ought, thanks to an opening weekend that suggests that this is the end of the line for the theatrically-released wing of the franchise. Likely the result of the brand being watered down hard since 2014, it's a shame for The Second Part: it's easily the best of The LEGO Movie's allied projects. Though its two predecessors aren't in any sense bad, The Second Part is still the first one since the original that doesn't wear out its welcome before the end, and the only one that has any compelling reason to exist in the form it does. The Second Part (and I concede that title is pretty cute, almost kinda Biblical, though that's weird if you go too far with it) picks up from where the first film's stinger ending left off, when Finn's dad, possibly as a form of passive-aggressive punishment levied upon his son for guilting him into letting him play with his LEGOs, invited his sister Bianca (Brooklynn Prince) to share in the fun. The Second Part encourages this reading: Will Ferrell is a disembodied voice this time around, and his rapprochement with his son five years ago appears to have led not to any long-term bonding over their shared passion, but to an abandonment of his hobby entirely. It's probably an accident, owing to the fact that this film's metanarrative can't exist alongside the moderating presence of an adult, but I find it amusing, considering I never particularly agreed in the first place with The LEGO Movie's thesis that Ferrell's dad was in the wrong for being mad at his son for wrecking his models. In any event, dad's really into golf now, though his offspring remain, due to the demands that each of these films serve as feature-length advertisements for the "construction system," a pair of off-putting LEGO freaks, now at odds for control of their dad's leftover bricks. Within the universe of the LEGOs, this conflict, begun by DUPLO monsters, and evolving from there, has taken on the form of the end of their world, leaving Bricksburg (renamed "Apocalypseburg") a flattened orange-and-teal wasteland that references a lot of movies, but especially Fury Road, and whenever anything colorful or pleasant is built, the aliens of what we'll learn is called "The Systar System" arrive to destroy it. Our Master Builders and the other residents of the LEGO world have adapted to their new circumstances by becoming hard-edged monochromatic bad-butts, especially Lucy (Elizabeth Banks), who was already halfway there. The exception is The LEGO Movie's chosen one hero, Emmett Brickowski (Chris Pratt), who is entirely unwilling, if not unable, to change in the slightest, presenting the same warmheartedly naive attitude he had in the last film, which had made him the most unpopular person in his community and has now done so again. It's partly his fault, of course, when the Systarians' general, Sweet Mayhem (Stephanie Beatriz), manages to breach their last defenses and kidnap his colleagues—Batman (Will Arnett, still amazing), Benny the Spaceman (Charlie Day, still amazing), Unikitty (Alison Brie, yes, still amazing), MetalBeard the Pirate (Nick Offerman, still, I guess, being a pirate), and, most importantly, Lucy—in order to render them back to the Systar System for an audience with her leader, the definitely not-at-all-evil galactic queen Watevra Wa'nabi (Tiffany Hadish). I feel like this franchise's wordplay has gotten worse, but maybe there's just so much of it you can handle in one five year stretch. But Emmett, whatever other character flaws he possesses, isn't one to give up, and builds a spaceship to take him beyond the Stairgate (see what I mean?) and rescue his friends, a mission that goes awry almost instantly. Things look bad, but out of seemingly nowhere arrives Emmett's salvation, Rex Dangervest (also Chris Pratt), who pulls his fat out of the fire and agrees to help him on his quest, so impressing Emmett with his five-o'clock shadow, his fist-shaped starship crewed by dinosaurs, and his give-no-dangs attitude that Emmett submits totally to Rex's tutelage, which they hope might finally make him a Master Breaker, the rough-and-tough kind of dude everyone (especially Lucy) has been saying he needs to be for the past half decade. So it's probably a little too glib to say that The Second Part repeats The LEGO Movie entirely, though the basic story is the same (the moral is identical: "uptight guy has to learn to share," the gloss being that the son cannot learn until he becomes the father). But it winds up being pretty specific in its reiteration, with a new gender dynamic that has a lot more to do with the five year gap between the films, that's brought the older brother to the cusp of puberty and wondering what kind of man he'll be. (Albeit apparently not one whose interests evolve beyond "pathologically-imaginative pseudo-autobiographical fan fiction in LEGO form.") The form this particular struggle for identity takes is mostly (and literally) internal, between Emmett and Rex, and certainly the most charming thing to me about The Second Part and the LEGO movies generally is that they're clearly annoyed by the same things I am, if Rex's omni-parody of Chris Pratt's recent spate of man's-man roles, but especially Owen Grady, Raptor Wrangler, is anything to go by. (Meanwhile, The Second Part arguably hates Batman even more than The LEGO Movie did, which is a lot.) It's more sophisticated than I think it even means to be: it's never remotely clear where "pop culture parody" ends and "Finn's schizophrenia" begins, but The Second Part frames Emmett, Rex, and Lucy as straight-up psychological projections; the funniest lines in the movie revolve around Emmett's constant self-aware surprise that Rex isn't a Durdenesque phantom telling him what he wants to hear. And it's at least interesting that it's the projection of the feminine inside his head who's pushed the ego the hardest of all toward the masculine. (I guess this is also why Bruce Willis is found crawling around in air ducts in this film, or maybe that's solely a reference joke, albeit a hilarious one in the telling.) It's also very much a film of its time, which means what you think it means, and though I don't think it's remotely subtle about this ("make everything awesome again! "), it's never clumsy and stupid about it, the way that, oh, say, Jurassic World: Fallen Kingdom is maximally both. Anyway, it's also funny about it, which is the crucial part, and it's funny about practically everything. There's a thirty-second span where it really looks like The Second Part is going to go into a harangue, and effectively serves as an apology for the masculine bent of the first film, which might have been more necessary if the first film wasn't already a self-apologizing parody; this comes in the midst of the first fifteen minutes, which is about how long the film takes to get its feet under it and stop copy-and-pasting jokes from the first LEGO Movie. Past that, it's usually pretty pristine as a comedy, though as with the puns, it's less funny than The LEGO Movie; or rather, I don't know if it's actually less funny, or if the LEGO Movie's brand of nicecore humor has just gotten battered with overuse over the course of four movies. If the first film was about an eight year old and "Master Builders," and this one's about a thirteen year old and "Master Breakers," is it for the best that they probably won't make another one? Now, I still found it very funny (being "less funny" than The LEGO Movie, or even The LEGO Batman Movie, isn't exactly a crime), though, naturally, your mileage may vary. It brings a certain novelty to the proceedings simply by going for it in increasingly ridiculous ways, in part by being a straight-up musical, replete with the same kind of overproduced pop pseudo-parody that made "Everything is Awesome" such a tremendous earworm. The standout, and the standout sequence of the film—coming right after a series of establishing moments that add the textures of fabric and cardboard to this plastic universe—is the reveal of that shapeshifting LEGO despot, Queen Watevra, whose song, "Not Evil," is a perfect encapsulation of everything great in the LEGO films: the kaleidoscopic color, the humorous engagement with its own fiction in obvious and childish terms, and the incredibly well-put-together bubblegum melodies, all inside a fantastic Broadway-style showstopper, "Broadway-style," anyway, if Broadway used a lot of autotune. Other numbers, "Gotham City Guys" (another wonderfully successful skewering of the Bat, this time playing on how much cooler Superman actually is) and "Everything's Not Awesome" (this being the song that crystallized in me my belief that The Second Part intends real political import, but maybe that was just me), are just as successful as works of pop music. And these aren't even all the catchy songs: there's also, literally, "Catchy Song," which does precisely what it says. Pity that it comes in the film's only really inept sequence: besides Lucy talking over it, a lot, and besides the movie deciding (like a lot of movies lately, to my unending chagrin) that music on the screen has to have a concrete diegetic source and is muffled by walls, etc., it's also where The Second Part seems like it's getting genuinely formally ambitious, cross-cutting the song across two scenes where it's being played simultaneously, but it's just unbelievably awkward at doing so, staying in each scene way too long before cutting back, possessing no sense of musical rhythm, and neither the sequence nor the song actually "ends" so much as another scene just starts up over them. It's flabbergastingly bad in its construction, and you'd like to blame Lord & Miller for not being there to do it right, but it's honestly surprising considering that my defining impression of actual director Mike Mitchell (graduating to a higher class of toy, I suppose, after doing DreamWorks' much-better-than-you-think-it-is Trolls film) was that he's really good at combining music, comedy, and montage, and that Trolls' own best moments are all editing-driven gags inside a phantasmagoric musical setpiece. Anyway, it's never so broken again as a work of animated cinema, and mostly it's another beautiful LEGO cartoon by Australian CG house Animal Logic, presenting new vistas (sometimes even in new ways), and while it's mostly things we've seen before—the colorful blocky shapes, the deceptively limited animation, the cuts to horizontal wide shots that emphasize the artificiality of the world, the cute cartoonish expressiveness of what amounts to 2D faces skinned onto 3D cylinders—I think this is definitely the aspect of the franchise that's worn the thinnest. It has a few stylistic surprises, even, sometimes crashing all the way into a child's notebook paper drawings, sometimes just being the prettiest CG it could be, and, in Watevra, being a constantly-changing collection of well-chosen hues, her shapeshifting constitution being the best reason I can think of that The Second Part, which in no sense otherwise represents any real advance, cost $30 million more than the first one. As an emotional journey, it works fully—almost as well as the first one (tearworthy? I say yes)—though the nagging doubts about point-of-view dog you most of all when it gets down to the heart of its brother/sister conflict. Probably better is when it's sticking to Finn and his inner conflict: it goes to some surprising, maybe not even entirely coherent (or entirely well-advised) places with Emmett and his voice actor's self-flaying composite, and, personally, I thought it was pretty cool (this marks the third time in the last 365 days that I've seen a new-release film that uses [Back to the Future] as a symbol of an unhealthy soul caught in a psychological trap). The worst thing about it is that Rex's remarkably-heartfelt denouement, which is obvious once you get to it, takes about five minutes too long to play out, and ends with a callback to the bar-none worst joke in the film. (Between this and LEGO Ninjago, somebody obviously thinks the concept of "trademarking" is funny. Maybe in some airless, rarefied, meta way, guys.) And the worst thing about the film, overall, might be that it's a movie that combines explicitly feminist themes with a moralizing ending that says "don't listen to your mom (Maya Rudolph)." All told, however, I think I loved it, and while it's demonstrably more flawed than its masterpiece predecessor, I think it might be (in some narrow ways) smarter, that time will be kind to it, and that it'll grow on me, just like The LEGO Movie did the first time around.